We usually buy stocks, based on tips, fundamental reports or technical views. In bulls markets, everything and anything seems to perform and we become complacent. It's the bear markets, which actually bears the truth when fancy names that have moved fast and furious fall with more vengeance and there are no exits. The leaders of past turn into destroyers of wealth, But, there are some sectors/business/stocks which do not lose any sheen in such conditions. To understand what factors determine a Future Proof Business. Which sectors & businesses will be able to absorb economic, technological or cyclical shocks. The Speaker will take queries with respect to Technical Entry Levels. Mr N S Fidai is the founder of Analyse India. He envisioned technical analysis as a medium to empower traders and investors with the knowledge to make informed investment decisions. His passion to share his knowledge with keen learners led to Analyse India to foray into the field of education. An ex–Banker with 13 years of experience in the Banking sector, Mr Fidai has an illustrious track record of 25 years plus in the Indian Equity markets, having started off in 1991. 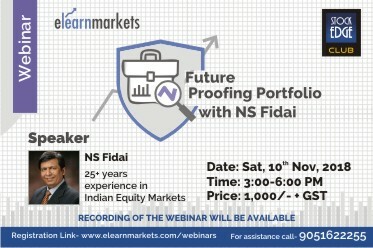 In the last 6 years, Mr Fidai has honed his skills in the art of Technical Analysis and emerged a successful Technical Analyst par excellence.